Return flights to Uganda from Germany for €318! Last minute return flights from Zurich to Phuket from €239! Oman Air promo sale: Milan to India €276, Bangkok, Sri Lanka €347, Nepal €401! Experienced travellers willing to visit this beautiful country might be interested in current great promotional offer of a Star Alliance member Brussels Airlines and their partner Eurowings. You may now book cheap air tickets from main airports in Germany to Entebbe. Uganda is a country that became much more safetier nowadays also Lonely Planet awarded this country as “number one destination in 2012”. Return flights to Uganda from Germany are now available for €318! Look for flights departing from Hamburg, Suttgart, Hannover, Berlin, Munich, Nuremberg or Frankfurt. Price shown is inclusive of all taxes and fees, onboard meals and 23kg checked bag. To reach the lowest fare available you have to book your return flight from Germany to Entebbe. Limited travel options are available between February and till June 2019. Book this Brussels Airlines promotional deal by 31st of January or until sold out. In any case please read carefully all requirements and mandatory vaccination (such as Yellow Fewer) before you book this deal. Major attraction in Uganda is tracking of mountain gorilla. Best place to go is Bwindi Impenetrable forrest where live more than half of the world´s population… In this place you have also great opportunity to spot chimpanzees or rarely seen forest elephants. 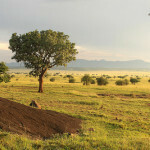 Booking sample of cheap return flights to Uganda from Germany for €318. In this case you would be departing from Hamburg to Entebbe on 11th of March. Your return flight from Africa back to Germany would be on 25th of March 2019.